Michael McFadyen's Scuba Diving - Shelly Beach, Manly Of the numerous Sydney beaches, the two most famous would have to be Bondi Beach and Manly Beach. Of these, Manly is probably not as famous overseas, although it is just as good, and probably better, when all its attractions are taken into account. Who in Sydney has never caught the Manly Ferry from Circular Quay over to Manly, walked down to the ocean beach and then had fish and chips on the sand or boulevarde? not many I would suspect. If you do this, when you are throwing down the chips, if you look about 45° to your right, you will see a bay. 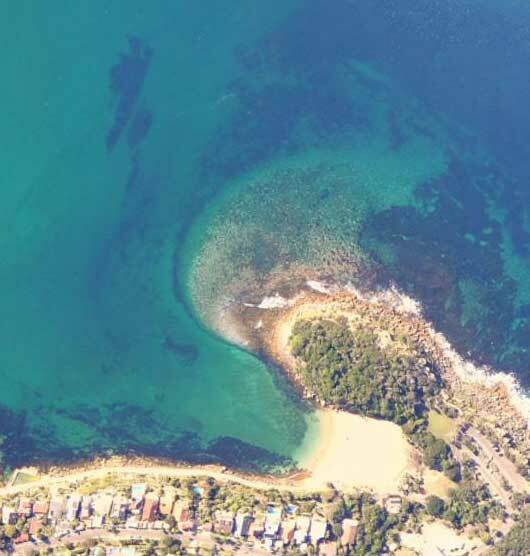 This is Cabbage Tree Bay and at the head of the bay is the small and very protected Shelly Beach. Both sides of the bay are dived, with the eastern side called Shelly Beach and the western side Fairy Bower. To get to Shelly Beach, head towards Manly and once on Sydney Road (the road from the top of The Spit), travel east till you drop down to Manly. Turn right into Belgrave Street and at the Manly Wharf, turn right into East Esplanade. Take either of the first three streets on your left and then right turn at the next street, Darley Road. Turn left into Addison Street, (part way up the hill) and then right at the next intersection (Reddall Street). This leads into Bower Street, turn right here and follow it right to the end. There is a double level carpark but the greedy Manly Council charges exorbitant fees to park here (in 2004 $7 for up to two hours and then an additional $5 an hour!!). If you are visiting on a weekday, very early on a weekend or at night, drop your gear as close as possible to the end of the first parking area and go back up Bower Street where you can park free. This is only a short walk away. Once geared up, go down the roadway or the stairs that descend to the beach. Cross the beach and enter the water on the right side. Follow the reef as far as you want, always keeping it on your right. The depth starts at 2 to 3 metres and gradually drops to 7 to 8 for a while before dropping again to 10 to 12 metres. All the way, the reef is composed of small boulders on your right and some flat rocks or ledges closer to the sand. The direction of travel will be north-west then north-north-west and then north. You will start to turn a bit to your right once you reach 10 metres and finally may end up heading almost due east. If you are very good on your air and have dived here a number of times, you can follow the reef out to the north-west, reach about 16 metres. To return to the beach, just follow the reef back on your left. The reef does not have much fixed life, there are no sponges, no gorgonias, no sea tulips, in fact, this whole site is somewhat devoid of life. You may see a few small rays, there are sometimes very isolated patches of ladder-finned pomfrets and one-spot pullers, but this is about all. I have seen some sea dragons here, but in my most recent dive (late 2004), we only saw these out past where most people turn around. I should add that some people have apparently seen small whaler sharks on dives here, but I have not had that pleasure. The site is a bit more interesting at night, when you may see more. In summary, my view is that this is a bit of a boring dive, worth doing once every five years or so and the occasional night dive. NOTE: The left side of the beach, basically along the promenade, sometimes has lots of dusky whalers (black whalers). These juvenile sharks are sometimes seen there in numbers up to 20 or so. See the Dusky Walers page for more details.